It’s Monday, July 30th. The forecast calls for a cloudless, sunny sky with a high of 93 degrees and 72 percent humidity. Two technicians in neon safety vests, with infrared cameras in-hand, drive a Kubota toward hundreds of rows of PV solar panels. Heat radiates from the panels, and the stale breeze generated by the cart provides little relief. The technicians know what lies in store:a grueling, 30-day inspection process, during which they will walk row by row, inspecting each and every panel, identifying, classifying and assessing anomalies impacting site efficiency. For solar Operations and Maintenance (O&M) providers, this scene is all too familiar. This is the O&M asset inspection method of old. Manual. Inefficient. Costly. Solar energy prices have fallen drastically, driven by significant advances in technology and the proliferation of sites across the US. Asset owners, financiers, and (by extension) O&Ms, have been forced to find ways to reduce operating costs to maintain their margins and remain competitive. The emergence of modern drone robotics and artificial intelligence in the past decade has unlocked new opportunities and efficiencies in virtually every industry. This presents an exciting opportunity for renewable energies, though they have been slow to adopt these innovations. While new and rapidly developing technologies such as computer vision, machine learning, and predictive analytics, may offer a vague path toward elusive and obscure holy grail of “Efficiency”, they also threaten to disrupt, and forever transform the industry’s traditional way of doing things. Figure 1. 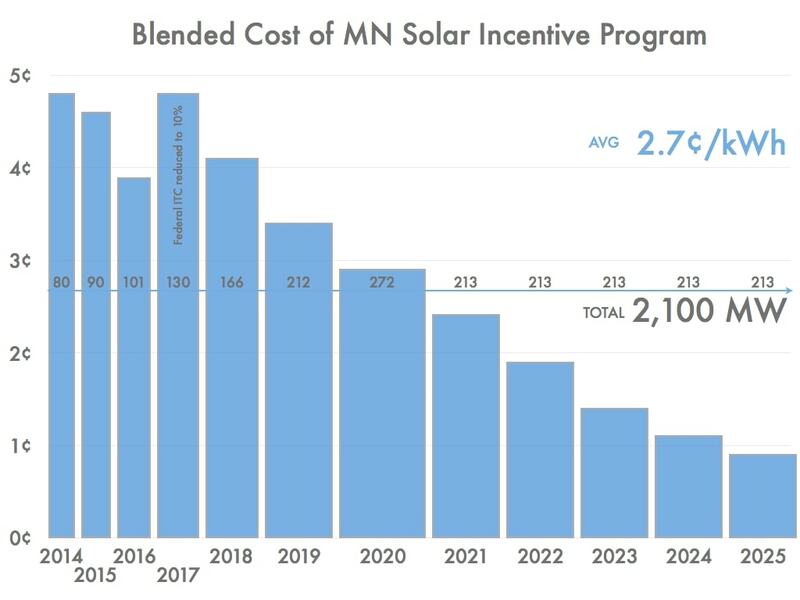 Blended Cost of MN Solar Incentive program. Adapted from “The Making of a Midwestern Solar Energy Standard,” by J. Farrell, 2013, Institute for Local Self-Reliance. Retrieved July 27, 2018, from https://ilsr.org/making-midwestern-solar-energy-standard/. It is estimated that for a 100MW site, a full-site inspection can cost more than $40,000, making it one of O&M’s costliest responsibilities. Understandably, many O&M’s elect to inspect their projects once a year, at most. Even those inspections may only cover a portion of the overall site. In fact, the US Department of Energy (DOE) estimates that for a 10MW ground mounted solar site, system/inspection/monitoring account for 12-18 percent of total expenditures. In light of this problem, there are three dimensions in which O&M’s can achieve cost savings: labor, time and analysis, and preventative measures. Drone robotics have seen incredible developments in recent years, making use and ownership significantly more affordable. Additionally, drone manufacturers have developed industrial-grade models with added durability, improved battery life, and specialized camera packages for industry-specific applications. These drones can now be easily outfitted with all the equipment required for conducting thorough inspections at the sub-module level. With drones, the inspection and data collection processes are both convenient and efficient. 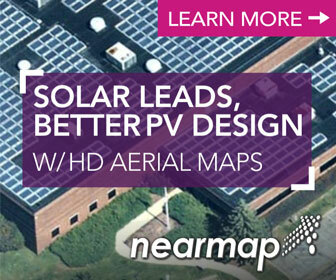 For a 100MW site, collecting the necessary aerial imagery takes one trained pilot three days to complete. Drone scanning yields a 90 percent cost savings, when compared to 30-day manual inspections. Furthermore, given the trajectory of drone innovation and Federal Aviation Authority (FAA) regulation, industrial applications of autonomous drones and out-of-the-box solutions could drive additional efficiencies for O&M’s over the next several years. Faced with the potential to drastically improve inspection efficiency, O&M’s should consider how drones can be integrated into their inspection processes, to reduce labor costs. Traditionally, analysis of the site and its health was inextricably linked to the inspection process – as technicians picked out hot spots amongst rows of panels, they recorded anomaly types and locations. However, if inspections become more automated, absent technicians on-site, how will O&M’s spot and prioritize these issues? When combining aerial thermography with Artificial Intelligence (AI), computer vision, and machine learning algorithms, software providers can automate data analysis. Not only can these providers identify a variety of anomalies (from diode and string failures to cracked panels), they can also geotag issues with extraordinary accuracy, using O&M As-Builts and geospatial positioning. Moreover, they can do so with unprecedented levels of speed; end-to-end analysis and report generation for a 30MW site requires only one day’s turnaround. Inspections have long been perceived as a cost center. Annual inspections have been habitually performed out of contractual obligation, or in reaction to major issues and unexpected dips in output. However, with rapid developments in predictive analytics and forecasting, asset inspections can transition from cost center to revenue driver. By incorporating weather forecasting, predictive analytics, and machine learning, O&M’s can engage in preventive and proactive maintenance, to prolong asset lifetime and maximize output. Major applications of these future technologies include anticipatory vegetation management, inclement weather protection, and smart benchmarking. 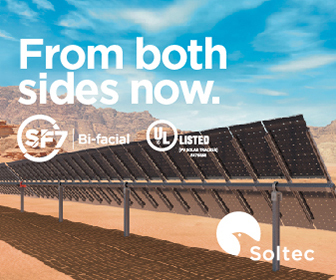 With the solar industry in its current state of flux and rapid change, O&M’s must “resolve the head-scratching equation of continuously reducing costs when the main resources they tap (people, vehicles and tools) are becoming more expensive.”Despite an uncertain future, aerial thermography, AI, and predictive analytics offer a path toward improved profitability. Ian Pu is Head of Business Development at Aerospec Technologies. Aerospec is an AI-powered smart asset management platform for the renewables industry that uses computer vision and aerial thermal imaging to improve inspection efficiency by up to 10x. Walker, A. (2017). PV O&M Cost Model and Cost Reduction [PowerPoint Slides]. Retrieved from https://http://www.nrel.gov/docs/fy17osti/68023.pdf. Brehaut, Cedric (2018, January). Low O&M Prices Drive ‘Digitalization’ and New Technologies. https://www.greentechmedia.com/articles/read/low-om-prices-drive-digitalization#gs.kvW74Vg. Weaver, John (2018, June). AI-infused drone O&M for solar farms – 50 minutes per MW.https://pv-magazine-usa.com/2018/06/22/ai-infused-drone-om-for-solar-farms-50-minutes-per-mw/. Deign, Jason (2016, October). Preventive maintenance: a different approachto PV O&M.https://http://www.solarassetmanagementeu.com/new-updates-source/2016/10/7/preventive-maintenance-a-different-approach-to-pv-om.